Living in the US, I take for granted that everyone accepts debit and credit cards as payment. We pulled up to a gas station in the southwest of mainland Greece and filled up. The gas station attendant handed us the bill and then waved off our credit card when we tried too pay. Clearly flustered because we didn’t have enough Euros for it, I tried to ask “where is the ATM?” The attendant pointed down the road and so I hopped out of the car while my husband when in search of cash. The attendant and I shared some awkward smiles. He cleared off a bench for me to sit and then returned to his business. I tried to pull a few phrases from my Greek phrasebook to say that I liked Greece or that this area was beautiful but it didn’t get much of a response from him. Customers came and went on motorcycles and in trucks. They eyed me but left me alone otherwise. I noticed a cat wandering the yard and followed it to get a closer look. (Well, really as something to entertain myself.) 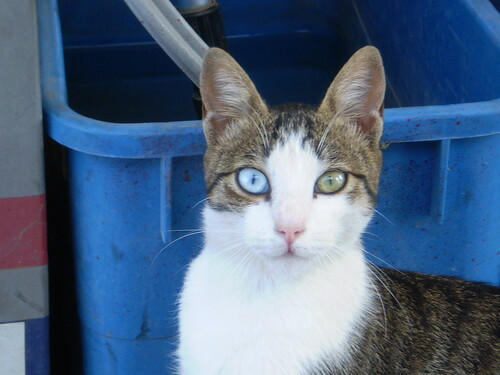 The cat had incredible eyes and was a great diversion while I awaited my gas station ransom. Meanwhile, my husband was stuck in a traffic jam in Stoupa. Two produce trucks had decided to park in the road while their drivers chatted. He claims that Stoupa is a beautiful beach town but that it is was hard to focus on a town’s charm while trapped in the road knowing I was waiting at a random gas station. It took him 45 minutes to get unstuck, withdraw cash and drive the 1km back to the gas station. I guess I should be really happy I had a cat to entertain me! I like the cats eyes very much!! Thanks for the explanation. I definitely learned my lesson and had cash for the next time!